I want to learn more about my Ronson Lighter? Can you help? Vintage-Ronson now provides comprehensive reports for your vintage Ronson products. Vintage-Ronson reports include 3 main areas of interest: Patent Information, Historic Product Catalog Information and Market Valuation Assessment. This service is exclusive to the Vintage-Ronson.com Internet community. All of our reports are user friendly and are designed to supply item specific information that can only be provided by a Vintage Product Specialist. 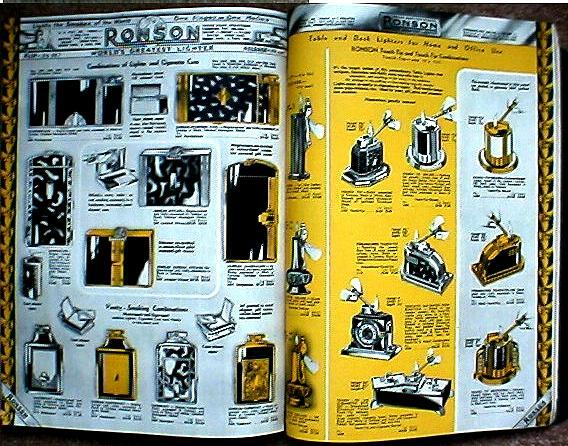 A valuable tool for anyone with an interest in old Ronson lighters or artistic metal products, each report will bring you closer to understanding your Vintage Ronson item in ways you never dreamed possible. Many vintage Ronson items have great value and only a knowledgeable and experienced product specialist can supply accurate and reliable information. Our reports cover in-depth product knowledge and little known facts not available through other resources. At Vintage-Ronson.com we track the market closely so we can assist collectors, buyers and sellers with valuations for a wide-range of vintage Ronson items. Often times, as with vintage items, subtle differences can have far reaching impacts on collector desirability and value. In addition, condition and completeness impact market value. With Vintage-Ronson reports, we have removed the guesswork for you and provide convenient and easy to understand information about the history and value of your item. We believe this approach benefits most efficiently those who seek specific information in a timely manor. Countless hours of research and data collection and cataloging has gone into the development of the most reliable and accessible information system ever. There is considerable research involved with each valuation and a vintage Ronson product specialist will personally research our extensive database for information on your product. We have designed this area to assist collectors and interested persons to learn more about their vintage Ronson Products and to discover their potential Retail value. It is very important to provide as much information as possible about your Ronson item. Patent Numbers DO NOT assist in determining the model or date of your item. For lighters please include exactly what is written on the bottom of the lighter or where you see the Ronson name and patent information. Once you complete the check-out process we will contact you via email to start the process. Vintage-Ronson.com now provides history and value reports for vintage Ronson products. Vintage-Ronson reports are designed to provide reliable information for novice and collector alike. Each report presents historic information covering Patent Drawings, Catalog Information and a Current Market Valuation Assessment. Many Ronson lighters, smoking accessories and other products have great value, as yours may! The benefit provided by a Vintage-Ronson Report is a proper understanding your items history and value in today’s collector’s market! The cost of the report is justified by the advantage you gain from accurate information in an easy to use format. This service is exclusive to the Vintage-Ronson.com community. We also offer a Finders Service for buyers and sellers of Ronson Lighters and other historic Ronson Art Metal Works merchandise. 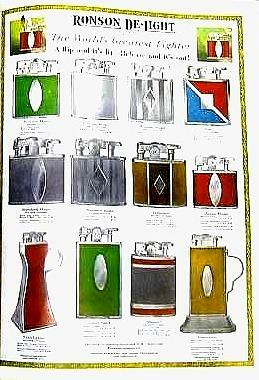 If you have a Vintage Ronson Lighter in need of Repair, follow this link.